Another set of custom back-to-back seating, this time completed in a grey/black colour scheme to tie back into the rest of the interior of this customers boat. The grey vinyl features the small pinhole recesses that are molded into the vinyl to achieve a cool look that makes the seats look a bit more modern than just your comparable grey flat vinyl. 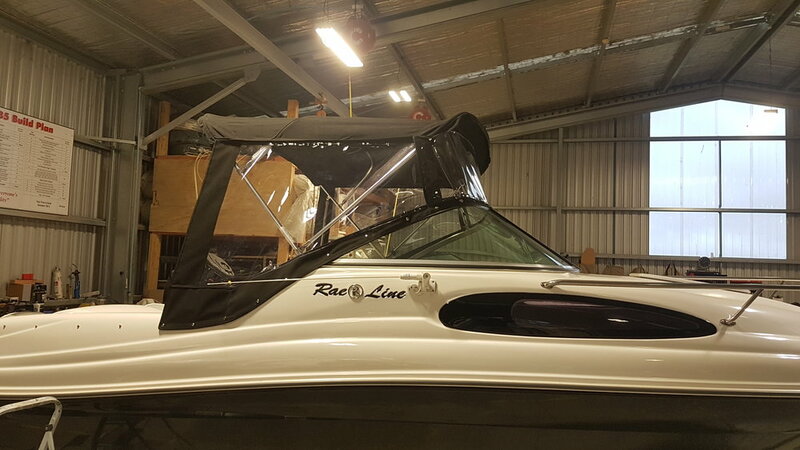 This customers boat required a new bow cover and so we offered up the solution to upgrade him to one of our zip walk-thru style covers that makes for a lot easier access to get up to the forward cleats, or to just access the bow area in any way really. After making a custom set of rolled poles to support the cover, we went about completing all the canvas work and fitting to his existing domes. A good way to finish off the week was another bimini that got fitted to this customers new Sea Ray 210 SPX. Once again, we used our upgraded mounting system as per the previous 230 SLX and got this bimini fitting and looking mint. We also keyholed the cockpit cover around the tower and now this customer should be ready to go have some fun on their boat for the remainder of the Summer! Another week, another specialized floating bimini to get fitted. After a bit of thought, we changed the forward mounting system over the holiday break in order to offer a far more secure mounting for the front bow of the bimini. 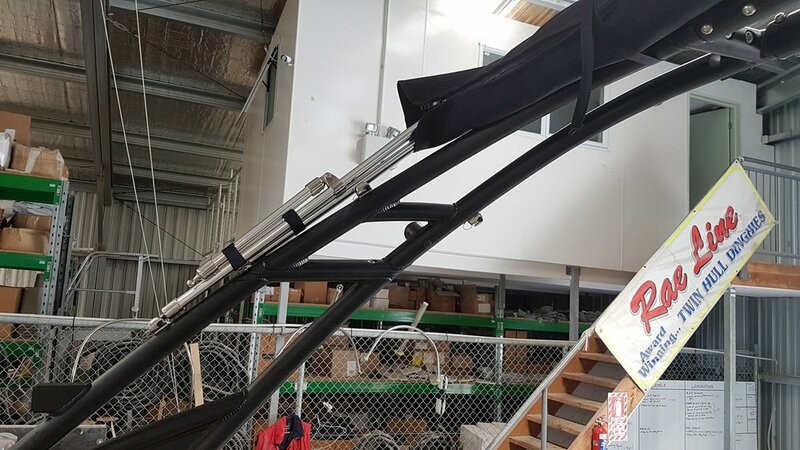 This involves a bit of fabrication for some thru-tower mounts to be fitted, but alleviates the opportunity for the bimini to flex too much under a heavy head-on wind while travelling at speed. 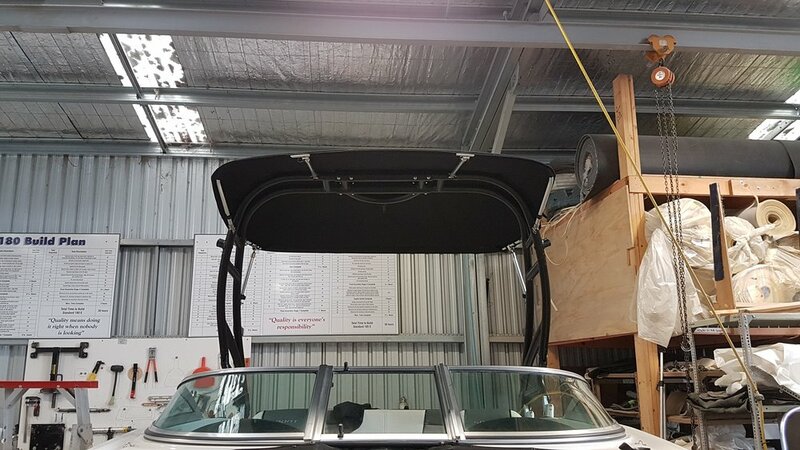 Either way, this 230 SLX customer will be sure getting some good shade under his new bimini that was custom made to suit the size of his boat. Along side the bimini, we also made a better fitting bow cover and keyholed the cockpit cover to go around the new Roswell tower. Another Sea Ray was brought out to us in order to have a suitable bimini fitted so the customer has some shade when out on the water this Summer. We went about making the frame to the right width and high enough to make sure there is easy standing room before creating a custom canvas section to fit to the frames. After the bimini was completed, we went about making the keyhole cuts in the cockpit cover to ensure the bimini can just be folded back and stay up in place without having to remove each time the boat gets the cover put on. 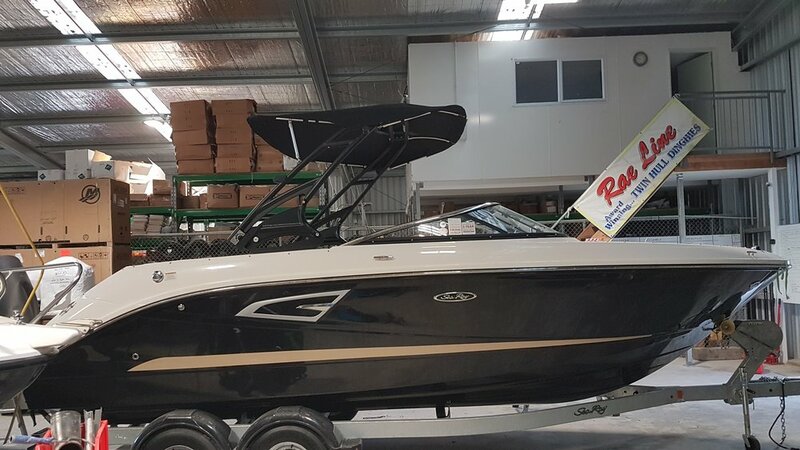 Straight after the last customer we got the same request for another floating style bimini on a Roswell wakeboard tower, this time fitted to a new Sea Ray 210 SPX. Going through the same motions of making the frame, fitting it to the tower and then completing the custom canvas cover, it all came together nicely to give another great looking bimini for this customer. This customer came in requesting the floating style bimini that solely mounts to the Roswell wakeboard tower fitted to the boat. They are a great bimini style to have as not only do they look the part, they provide an unobstructed view when looking out forward from the helm and are easy to deploy and retract, all the while providing the same length of shade that you would get out of any other standard bimini top. Having just brought this used Rae Line 186, the customer requested a bimini and front and side clears to suit. So we got stuck in to get the bimini up and sorted, before mapping out and making a custom set of clears to suit. No doubt that this customer will have plenty of protection from all the elements for this coming boating season! After the neighbour of this customer got a bit of overspray down the side of his boat and all over his covers, we went about replacing both the bow and cockpit covers to suit along side completing the gelcoat repairs to remove the overspray and bring back a good gloss. Another happy customer after we went about replacing his older grey canvas covers that were starting to tear around the seams, with new black canvas covers. Alongside that we went about making a custom bimini top, and being quite a tall man, was requiring that he fit underneath it without a problem. Once all made and fitted, we keyholed the cockpit cover and made a custom bimini boot with the ‘Sea Ray’ embroidered on to it. Needless to say, the boat left looking sharp! This customer came to us with some of the seats and the engine hatch covers already upholstered, but was having troubles getting the rest of the job done. We went about doing a custom digital design to ensure he was happy with how it would look before we went about turning the design into reality. Alongside that, we turned the helm and passenger seats into heated seats so that those on-board will find themselves nice and toasty while sitting and watching the action out the back! After leaving a tyre on the sunpad of his boat over the winter period, this customer came back to find that it had stained the vinyls. Unfortunately we were not able to source exactly the same grey and yellow colours that were used through the boat, so we went about recovering with our liquid silver vinyl that came in pretty close to the originals and keeping the customer happy. 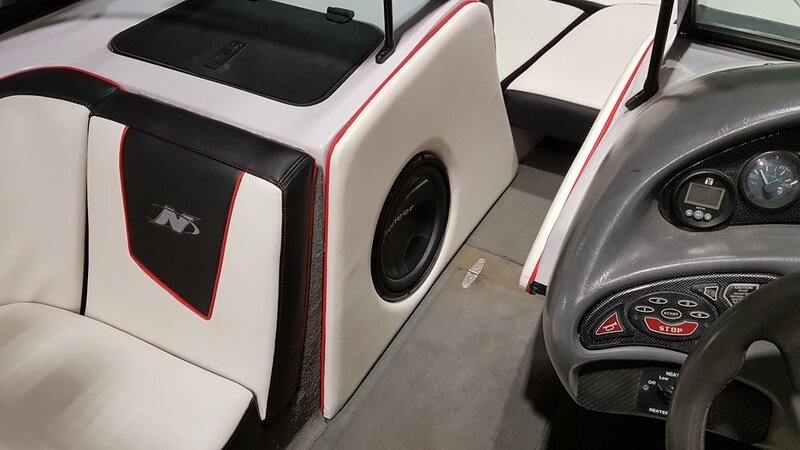 Having just purchased his Sea Ray, this customer thought more could be done with the boat outside of the plain white vinyl interior and the red hull side. He wanted a bit of contrast and so along side respraying the whole hull side from red to black, we went about adding in custom sections of vinyl in black to help add to the look of the boat. With custom ‘Sea Ray’ embroidered sections to back on the helm and passenger seats, and with a new full set of black canvas covers to replace the old red ones, the boat came out looking super sharp. But we were not done…. the customer wanted a custom seat of teak styled carpets along with the custom ‘Sea Ray’ teak table we supplied. All-up it made for one classy upgrade to a great boat! 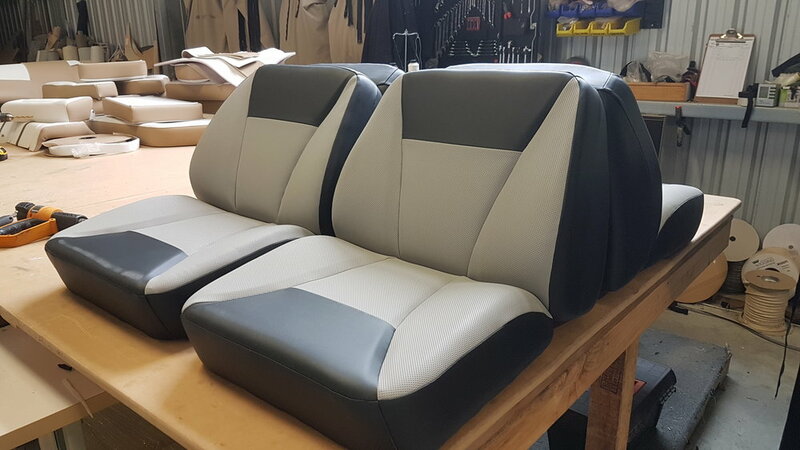 To match in with the colour scheme of his boat, this customer requested two custom back-to-back seats to be completed in black and silver vinyls. After we cut, sew and upholstered the seats, we fitted them to their bases that allow the seats to slide out into a lounger, before packaging them all up and sending them off to the customer to be fitted into his boat. This wakeboard tower was imported from the US to go specifically on a Sea Ray model. Before the tower was sent off up north to Auckland to be fitted, we went about making the bimini top for it and getting it all ready for the customer. 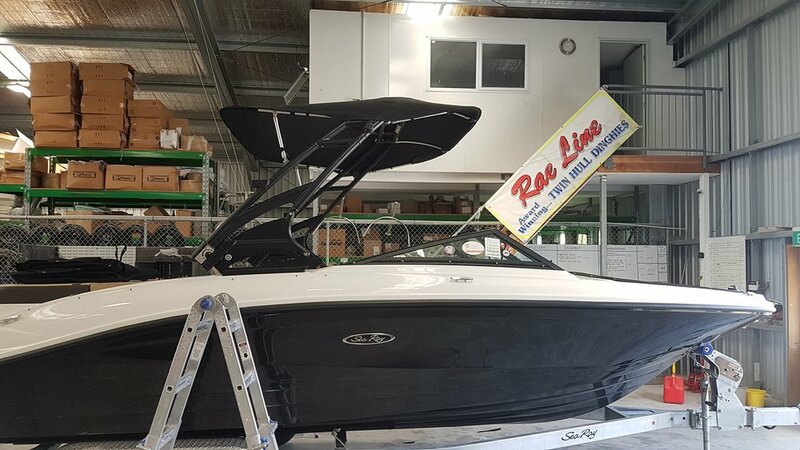 Alongside custom fitting the wakeboard tower to this classic Sea Ray 230 Signature bowrider here at Rae Line, we went about custom making a free-standing bimini top that only relies on the tower for support, and all folds back up into a boot while staying attached to the tower. This will provide great sun protection for all on-board while spending those long summer days out on the water! 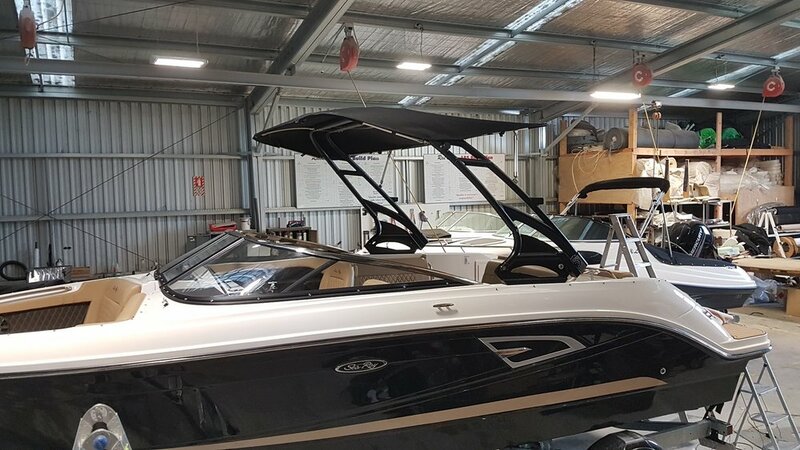 This new Sea Ray 180 Sport came to us with it’s new wakeboard tower fitted, but the customer required some sun shade to go with it. As such we went about measuring up and creating a bimini frame to suit the width and style of the boat. 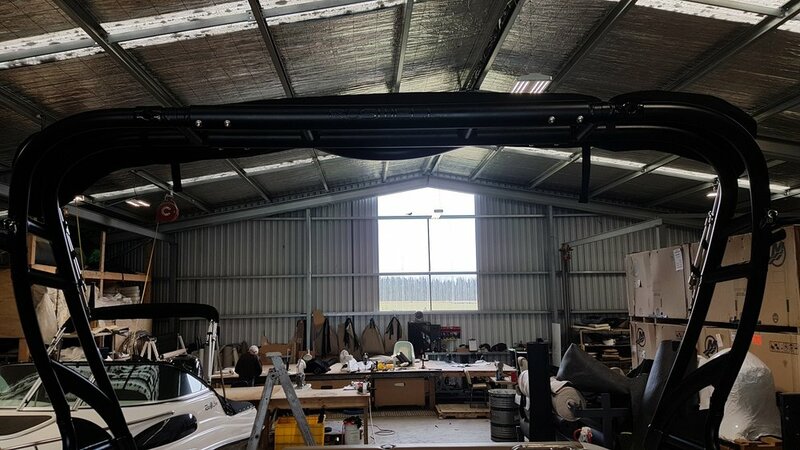 After complete the canvas work to suit, we fitted it all up and added some additional mounts lower down on the tower so that the whole bimini can be packed up and fitted down into the lower mounts while strapping itself to the tower. This saves from having to store the bimini inside the boat and makes for an easy deployment of the bimini when it’s time to hit the water! After we got an order for an all-red 180 bow rider of ours, the customer requested a custom set of upholstery to go with the boat. So we went about designing and making this set to suit the colour scheme and keep within his “Ferrari” styled boat request.